Overlapping that take place between atoms having half-filled s – orbital in their outermost energy shell. In the formation of hydrogen molecule, 1s orbital of one hydrogen atom overlap with 1s orbital of other hydrogen atom and thus forming a sigma bond. Half filled s-orbital of one atom overlaps with the half filled p- orbital of another atom. In the formation of hydrogen fluoride, 1s orbital of hydrogen overlaps with 2pz orbital fluorine. 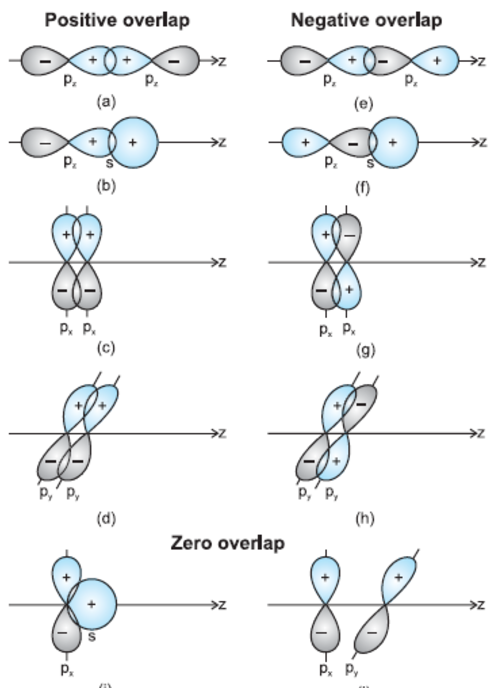 This type of overlapping occurs when p-orbital of one atom overlaps with the p orbital of the other. The molecule of fluorine is produced by overlapping of 2pz orbitals of the two fluorine atoms. If Z axis is chosen as the internuclear axis, no overlapping can take place between s and px , py or pz orbital i.e. there is zero overlap. Pi bond is formed by lateral or sideways overlapping of p orbital that is why overlapping of p orbital in a direction at right angles to the inter nuclear axis. In oxygen molecule the electronic configuration is 1s2 2s2 2px2 2py1 2pz1 , the two atoms are held together by one sigma bond and one pi bond. In nitrogen molecule the electronic configuration is 1s2 2s2 2px1 2py1 2pz1 atoms are held together by 1 Sigma and 2 Pi bonds. (1) The strength of a bond depends upon the extent of overlapping. (2) In the formation of sigma bond overlapping is along the internuclear axis ,therefore ,there is considerable overlapping. Hence, the sigma bond is a strong bond. (3) In case of formation of Pi bond, sideways overlapping take place which is only to do a small extend. Hence π bond is a weak Bond. In sigma bond ,the electron cloud is symmetrical about the internuclear axis and in π bond, it is unsymmetrical, being more concentrated above and below the plane of atomic nuclei.